Prior to working on this article, I knew Incra’s products only by reputation. This was my opportunity to find out if the three beliefs I held about the Incra fence (very accurate, very expensive, very complicated) were at all correct. incredibly accurate, but it’s not terribly expensive nor is it all that complicated. Don’t get me wrong, you’ll have to shell out about $450 for the system shown here. So it’s no small investment. 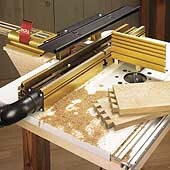 But when you compare that cost to the combined cost of a great router table fence, a great box joint jig, and a great dovetail jig — all of which the Incra is — the price of this single system seems quite reasonable. As for being complicated, it’s more accurate to think of the Incra as complex. There’s a lot here to learn and understand. But the manual that comes with the system does an outstanding job of communicating the intricacies of this system in plain, easy-to-follow steps. And once you understand it, well, you understand it. At the heart of this system is the positioner. This is where most of the adjustments and fine-tuning are done. The three-position lever toggles the positioner between gross adjustment (lever all the way down), fine adjustment (lever in the middle position), and locked (lever all the way up) (Fig. 1). By looking through the window in the top of the positioner, you can align the fence on the appropriate scale to within 1/32" (Fig. 2). But if that’s not quite fine enough, you can use the micro-adjustment knob to fine-tune the fence in .001" increments (Fig. 3). FIGURE 1 - The three-position lever allows you to select from gross or fine adjustments, or locked. FIGURE 2 - Interchangeable scales are marked for specific joint types and sizes. The steel rule slides in its slot to allow the fence to be “zeroed” out. FIGURE 3 - A micro-adjustment knob and “zero-able” scale allow for adjustments as fine as .001". The scales are another important part of this system. The steel rule is a constant and serves for most basic positioning. For more involved operations, such as box joints or dovetail joints, the plastic scales are replaceable. A large assortment of these scales comes with the Incra, and each one is marked for a specific size and type of joint. Of course, every other function and operation of this fence is equally precise. For instance, adjusting the outfeed face for jointing is done by sliding it along a wedge that allows for an offset as small as .002". Other standard equipment with the LS17 is a right-angle fixture and a micro-adjustable stop block. Both of these are essential to box and dovetail joinery, but they have a variety of other uses as well. I should point out that mounting this system on most tables will require some type of auxiliary platform. But for all this system does, the extra effort pays off in spades. And in truth, I’ve run out of space well short of lauding all that this system is capable of. It will have to suffice for me to name it our Editor’s Choice and assure you that it’s worth every dime.